No, seriously. When I said this to a friend who knows me well, he just laughed and knew exactly what I meant. He said “So, what do you need to do differently?” I guess the answer is, I need to try to look at the elements of my business as the different items of washing. Underwear – hung over my left arm, to be easily put in to colour order & hung first. Socks – put on the side of the washing basket (in vague pairings), so they don’t have to be hunted down. Shorter tops etc – to be nearer the top for ease of sorting. THEN the really important stuff happens….. the hanging … and this is the same whether it’s outside on the whirly-gig, or inside on the airers. First you hang the underwear, in colour blocks. I’ve been informed by some that this is bonkers …. But to me it makes perfect sense. It’s not like I have to have matching pegs on each item (that would be a step too far even for me!) and if I’m in a rush to get somewhere it is possible for me to just hang things as they come (although I will admit to really not liking it!) However, hanging out the washing like this doesn’t take a whole much longer than just throwing the clothes on the line any which way, and it makes putting them away, once dry, a whole heap more efficient as everything is already with everything that it lives with in the drawers or wardrobe. What is your business, or day, like? 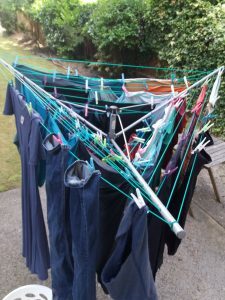 Is it like my washing line, with processes that work to create a smoother, more efficient, way of running things – or do you just pull everything out in to the basket, and hang it up in any old order, and do the sorting and folding and running about with the putting away? I know that effective systems and processes make an easier, more time-efficient business, once where tasks can be handed over to others. This was highlighted by Marianne Page, business systems expert, when we shared an interview couch at Media Sound Wave, back in February this year. So where can I make my business more like my washing-line? As CEO and chief tea-maker of your business when you work alone, I’m learning it is even more important that there are things in place to help. My business has grown from something I did that supported my acting career, to something that has become a business, not a supporting role. I am always my best self for my clients, so how can I be my best business for me, and maybe make the journey easier for both me and my clients – what is my business washing line like? Empty the machine – Ah!! The planning of the day – knowing what lies ahead of me, so that I can gather the tools I need, or get the right spreadsheets up and ready to be filled once I’ve done the calls/seen my client/checked the bank account etc. Preparation, preparation, preparation! Underwear – I think these are those jobs that need to be done in small batches, ones that are actually quite easy as long as I do them together, at once, and possibly weekly, rather than as they come up – which is what I think I tend to do. Socks – these are the jobs that need a little more detail – I need to give myself time to make sure that the matching is done – does that task relate to another element, need confirming on a spreadsheet or cross referencing in the diary, checking with someone else? Also do I need to be checking for holes?! Small tops – Daily jobs that get done first, so they’re out of the way and time is clear. Longer tops – The regular work that might need a little more preparation (turning those long sleeves the right way round takes a bit more time) and there’s quite a lot of them – things like networking, client clarity calls, research & prospecting. I need to give these more time. Skirts etc – the fun stuff, a quick shake and the line looks pretty – this is probably my creative work – the stuff I get distracted by ideas of, but don’t do as much a I’d like to. Jeans & dresses – This is the hard working element, first to come out of the machine, last on the line, but so they get the best of the sun – the structure of the business, seeing clients, speaking at events, delivering products. Well … there we have it .. my business washing line – what does yours look like? What elements do you have that can be handed over to other people – or what do you know you need to do more of? I know that once the washing is out I’m free to get on with things, and the putting away won’t be so much of a chore later. What will your system free you up to do? Well, this “small-top” job is now complete. It’s time for my morning walk and then to start implementing some of the above … and to really be able to let that possible new PA take over some of the ‘longer-top’ work that I’ve been neglecting…. Oooh … I like this way of working! Let me know your thoughts below and if you like my style you can find more blogs here on website.